A new grief support group has formed in Taylor County, and meetings begin Sept. 2. Dr. Lynda Collins will lead the group, which will meet for 13 weeks at St. Andrew United Methodist Church. The group is called GriefShare and is a special weekly seminar and support group for people who are grieving the death of someone close to them. It's a place to be around people who understand what the others are feeling. At GriefShare, those attending will learn about recovering from grief and renewing hope for the future. Greater Campbellsville United will sponsor its annual community Diversity Festival on Saturday, Sept. 20, from 10 a.m. to 2 p.m. at Taylor County Extension Office. There will be several activities, including a youth art show. Students in kindergarten through high school can use any medium to express what makes them unique. All participants will receive a ribbon and be entered into a drawing for a prize. Booth space is now available for the Green River Arts and Crafts Festival, which will be Saturday, Nov. 22. The annual festival will be from 9 a.m. to 5 p.m. at Taylor County middle and high schools. Taylor County Band Boosters sponsors the event. Vendors will begin setting up on Friday, Nov. 21. Booth space is 8x10 and rental fee is $40 for the day or $70 for two spaces. Access to electricity will cost an additional $5. Canopies aren't allowed and vendors are responsible for their tables and extension cords. A 100-year-old oak tree on Campbellsville University's Stapp Lawn is now an 8-foot, 2,000- to 3,000-pound set of praying hands. 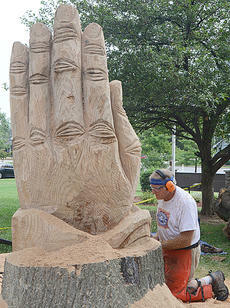 Rob Peterson, a Louisville chainsaw artist, carved the praying hands for the university. It will be placed outside the pergola between the Administration Building and Stapp Lawn. Campbellsville Business and Professional Women's Club members will visit local high schools Tuesday, Aug. 26, to encourage students to register to vote in honor of the day being Women's Equality Day. 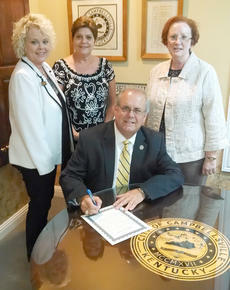 Last week, club members joined Campbellsville Mayor Tony Young as he signed a proclamation proclaiming tomorrow as "Women's Equality Day" in Campbellsville. This year's annual Green River Lakeshore cleanup is Saturday, Sept. 20, from 9 a.m. to noon. Those who would like to participate in the trash pickup should come to the Smith Ridge Boat Ramp, State Park Pavilion, Site One Boat Ramp or the Holmes Bend Boat Ramp. Lunch will be served and prizes given away at 12:30 p.m. at the Green River Lake State Park picnic shelter at the state park. Volunteer boat drivers are needed to man boats for the event. Drivers are also needed for the fishing with a veteran event on Saturday, Oct. 4. Campbellsville University's Theater Department will host auditions for the musical, "Dolly Parton's 9 to 5!" on Monday, Aug. 25, and Tuesday, Aug. 26, at 6:30 p.m. at CU's Russ Mobley Theater. The musical is based on a movie of the same name, with music and lyrics by Dolly Parton. The plot involves three women - an overworked office manager, a jilted wife and an objectified secretary - who conspire to depose their smarmy boss and begin making woman-friendly changes in the workplace. The annual fall heritage festival at The Homeplace on Green River will be Saturday, Sept. 6. The festival will feature a photo workshop by Lindsey Wilson College professor David Goguen. There will be sessions from 10 a.m. to noon and 1 to 3 p.m.
Homeplace officials ask for a $5 donation for parking, but there is no charge for the workshop or for many of the other activities at the festival. Goguen is an experienced photography teacher and this will be his third year leading a photo workshop at the festival. Three Campbellsville University music faculty members have been invited to perform at the National Flute Convention on Aug. 7-10 in Chicago, Ill.
Dr. Lisa McArthur, professor of music, will play flute. Dr. William Budai, associate professor of piano, will play piano and Saulo DeAlmeida, instructor in music, will perform on the cello. They will perform "Trio, opus 86" by Nikolai Kapustin at 9:30 a.m. Friday, Aug. 8, in Chicago. Taylor County's Farmers' Market has expanded. Local farmer Jacky Pierce will set up shop at the corner of South Court Street and Commercial Street selling produce starting at 9 a.m. on Tuesdays and Fridays through October. Pierce will offer fresh vegetables for sale till 5 p.m. The market will be from 8 a.m. to 2 p.m. at its home location on KY 210, near Taylor County Animal Shelter, through October. For more information, call the Taylor County Cooperative Extension Office at (270) 465-4511.